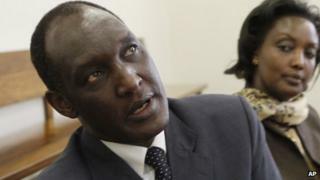 South Africa has expelled three Rwandan diplomats in connection with an attack on the home of an exiled Rwandan dissident, diplomatic sources say. Rwanda responded by ordering out six South African envoys, officials said. The moves come after armed men raided the Johannesburg home of Kayumba Nyamwasa, a Rwandan former chief of staff, earlier this week. Lt Gen Nyamwasa, an exiled critic of Rwandan President Paul Kagame, was not at home. However, the property was ransacked and a computer and some documents were taken. Gen Nyamwasa has already survived two assassination attempts. He was shot in 2010 in an attack widely blamed on the Rwandan government, although it denies this. A diplomatic source, who declined to be named, told Reuters that South African security services believed those responsible for the latest attack were intelligence personnel attached to the Rwandan embassy. Rwanda has denied any involvement in attacks on exiled dissidents living in South Africa. In January the body of a Rwandan former intelligence chief turned dissident, Patrick Karegeya, was found in Johannesburg. He had apparently been murdered. Shortly afterwards President Kagame warned that those who betrayed his country would face what he called "consequences". Mr Karegeya and Gen Nyamwasa were co-founders of the opposition Rwanda National Congress. Both were part of Mr Kagame's rebel forces that came to power in 1994, ending the genocide of their fellow ethnic Tutsis. Rwandan dissidents in several Western countries, including the UK and US, say local security agents have warned them of plots to kill them.